Jackson's chameleons were not discovered by a scientist named Jackson; rather their name comes from an ornithologist and prior governor of Kenya, Frederick Jackson. These chameleons were native to East Africa, but in recent years have been introduced into California, Hawaii, and even Florida. Young Jackson's chameleons are brownish in color, developing brighter green coloration at about 4 or 5 months of age. Males tend to be more brightly colored, with blue or yellow markings. They're sometimes called three-horned chameleons because the males of the species have small brown horns above their eyes and one on the nose. Names: Jackson's chameleon, Chamaeleo jacksonii, Jackson's horned chameleon. Lifespan: Five to 10 years in captivity. Size: Jackson's chameleons range in size from about 9 to 13 inches in length (including the tail). Males tend to be larger than females. Jackson's chameleons are territorial and should be housed individually. Handling is stressful to them, so as with other chameleons, they are pets better suited to being watched than handled. Chameleons should never be kept in a glass terrarium. They need the ventilation provided by a mesh enclosure; fine metal or fiberglass mesh is not recommended. Vertical space is essential since chameleons like to climb high up off the ground. An outdoor cage can be used when the weather is warm enough, as long as overheating is prevented. Cleanliness in the cage is vital in preventing bacterial and mold growth. Using paper towels or newspaper to line the cage makes cleaning easiest. Some keepers use soil (no vermiculite or perlite) or peat moss, but these are harder to keep clean and dry. Potted plants can be placed on a plain paper substrate for easier cleaning while still allowing live plants in the cage. Do not use wood chips or any other substrate that could be accidentally ingested and cause blockages. Provide lots of sturdy non-toxic plants and branches for your chameleon to climb on. Ficus trees have often been used in chameleon housing but require some caution as the sap can be irritating. Other plants you could try include pothos, hibiscus, and dracaena. Artificial plants may also be added; artificial vines work well. A good selection of branches (of different diameters) should be provided, making sure there are secure perches at different levels and temperatures within the cage. For Jackson's chameleons, a daytime temperature gradient of about 70–80 F (21–26 1/2 C) should be provided, with a basking spot up to a maximum of 85 F (29 C). At night, they should have a temperature drop of about 10 to 15 degrees Fahrenheit (five to 10 degrees Celsius), so heating at night may not be required if your home's temperature doesn't fall below 65–70 F (18–21 C). Heating is best accomplished by using a basking or incandescent light in a reflector or a ceramic heat element, any of which should be placed outside of the cage to prevent burns. Chameleons also need a full-spectrum ultraviolet (UVA/UVB) light source, so you should invest in a good bulb. Keep the UV light on for 10 to 12 hours per day. Remember that these bulbs need to be replaced every six months or based on manufacturer's recommendations. Chameleons benefit from spending time outdoors in natural sunlight when the temperatures are appropriate but beware of overheating as Jackson's chameleons do not tolerate well temperatures over 90 F (32 C). Jackson's chameleons need a humidity level of 50 to 80 percent. This can be accomplished by misting the plants in the enclosure regularly (at least twice daily) and through the use of a drip or misting system. Chameleons rarely drink from a water bowl, but they will lap up droplets of water off plants; the misting and a drip system also serve as water sources. Position a drip system so that the water droplets cascade over the plants in the enclosure. Also, invest in a hygrometer to measure the humidity. Chameleons are insectivores, so feed them a variety of insects. Crickets are usually the mainstay of the diet but mealworms, super worms, and waxworms (all in limited quantities), roaches, silkworms, flies, fruit flies (for young chameleons), and grasshoppers can also be fed. Wild-caught insects should only be fed if you are certain they have not been exposed to pesticides, and always avoid fireflies. All insects should be gut loaded before feeding them to your chameleon. In addition, some chameleons also eat a bit of plant matter, including live plants in the cage, so use nontoxic plants. Collard greens, mustard greens, turnip greens, and sugar snap pea pods are possibilities (try attaching them to the side of the cage). You will have to monitor your chameleon and adjust feeding amounts as needed; if many insects are left uneaten or your chameleon is too full-bodied, back off the amount fed. Don't leave uneaten live prey in the cage for extended periods of time as the insects may attack and injure your chameleon. 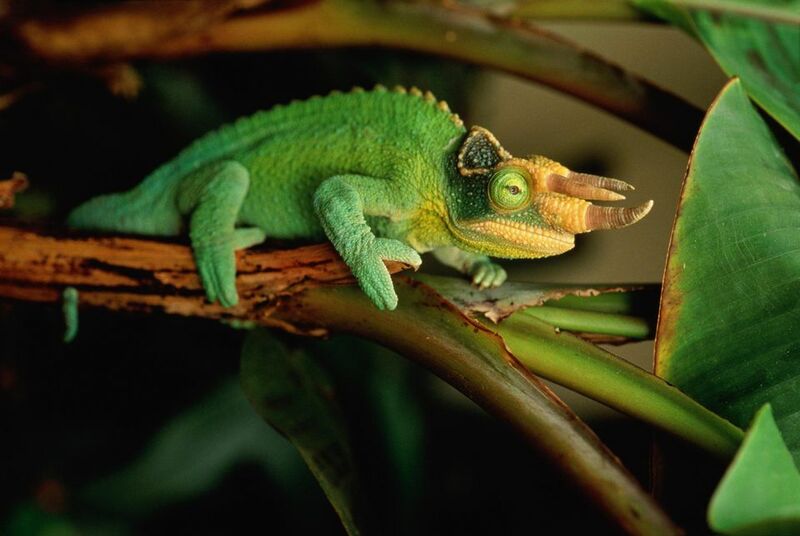 Parasitic infections are very common in insectivores, especially if the animal is stressed or ill. As with most reptiles, Jackson's chameleons are prone to respiratory infections and fungal infections. These conditions should receive care from a reptile veterinarian. Look for a reputable breeder to ensure your pet has been treated appropriately. Chameleons should have alert eyes, without any cloudiness. Swollen limbs or digits may indicate an infection, so be on the lookout for this condition. If your Jackson's chameleon is drooling or wheezing, these are signs of respiratory infections. Jackson's chameleons should have skin without bruising or cuts. The first thing you should do after you get your Jackson's chameleon is have a reptile veterinarian check it for parasites. For a full list, check out our profiles of more chameleons.